on the woodside. : *blazing noodles. It's never all that cold in Alabama (despite my inability to procure any sort of appropriate winter wear); Facebook status updates from my North-Midwestern family serve as a constant reminder. They're all, "BURIED IN SNOW. SEND HELP." 1. The vast majority of the citizenry will temporarily take leave of their ability to drive. 2. Schools will immediately shut down and fling their doors wide, sending all manner of small people scattering, unsupervised, into the streets where the terrible drivers are. 3. Local news anchors will report grocery store shortages of bread and milk, while the Winn-Dixie near my home will mostly run low on buy-one-get-one-free boxes of Cheez-Its and cases of beer. It's really more of a toss-up than it sounds; grocery option A is shiny and new but has minuscule aisles (the better to cram all that fancy stuff into) and is full of oblivious people and people who still write checks. Grocery option B, on the other hand, is the fastest route to possible stomach ailments but also has self-checkout and a stunning Asian foods selection. I usually choose B. I'm tough. I braved the frozen precipitation last night to procure the necessary items to make my very favorite spicy noodles with spicy shrimp dish, adapted from Evil Shenanigans. I don't know when I first tried this one, but I've made it several times since, and it always delivers. Shenanigans calls it "fancy enough for company, yet easy enough for a weeknight," and I've made it for all kinds of reasons—internationally visiting family, nights curled up in my holey socks when nothing but peanut noodles will do. 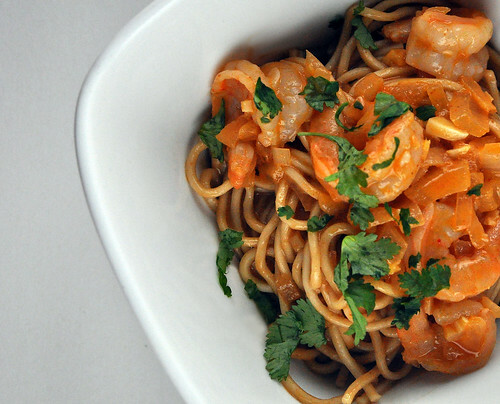 It looks like a long list of ingredients, but you're doubling up on most of them to use in the shrimp sauce and the noodle sauce. That's great, because it means you can make the noodles on their own any time you like—for vegetarians, with a different protein, or just because they're that good. These are some aggressive flavors, which is why I love them so much, but you may need to back off on the sriracha or the curry paste; I like to make it just hot enough so that your face falls off. There's something wicked about NEEDING to have another bite just to take the edge off the bite you had before. My sense is that the best recommendation you can give a recipe is that just looking at the photos conjures the sense memory of tasting it. This is some seriously mouthwatering, fire-breathing business. And the noodles are even better the next day. Last night I chose grocery option B, which meant the fish counter was completely, inexplicably empty, like it'd been the victim of some bacterial outbreak, but there was a lone pack of peel-and-eat shrimp that didn't look toxic. They were very small, though (51/60), so this version leaned a little toward the noodley side (all the better). I go very heavy on the ginger and curry paste, because I love it. 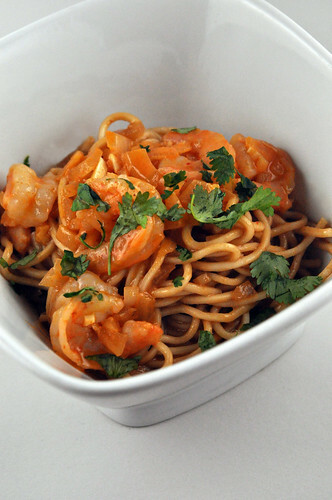 Do not be fooled into buying spaghetti for this recipe—it will still be tasty, but there's a lightness to the lo mein that's absolutely worth it, especially when you're talking about dunking them in peanut butter. The Chinese noodles are cheaper, too, so get them if you can. Just as deliciously radioactive as it looks! 1. Cook noodles according to package directions; drain and set aside. 2. Combine vegetable broth, soy sauce, sesame oil, peanut butter, 1 tablespoon sriracha, 1 tablespoon red curry paste, 2 garlic cloves, 1 tablespoon ginger, and ½ the chopped onion in a medium saucepan over medium heat. Squeeze in the juice from ½ a lime, and whisk until the mixture comes to a boil. Reduce heat to low, and let simmer 10 minutes, stirring often. 3. Heat 1 tablespoon oil to a large skillet over medium heat; add shrimp, and cook just until shrimp start to turn pink. (Shrimp will not be fully cooked.) Remove from pan, and set aside. 4. Heat remaining 1 tablespoon oil in skillet over medium heat, and sauté remaining 2 garlic cloves, remaining 1 tablespoon ginger, and remaining ½ chopped onion until softened and fragrant. Stir in coconut milk, fish sauce, remaining 2 teaspoons sriracha, and remaining 1 tablespoon red curry paste. Squeeze in the juice from the remaining ½ lime; stir in sugar, if desired. Mix well, reduce heat to low, and cook about 5 minutes or until sauce thickens. 5. Raise heat under saucepan to medium, and bring peanut sauce to a boil. Whisk cornstarch with 2 tablespoons water in a small bowl; whisk into peanut sauce until combined, and let thicken about 1 minute. 6. Meanwhile, toss shrimp into sauce in skillet; cook 30 seconds or until shrimp are just cooked and heated through, and remove from heat. 7. Toss noodles with peanut sauce, and divide among serving bowls. Top each with shrimp and sauce. Garnish, if desired. Makes 4 servings. thanks for stopping by! i hope you make it; it's really delicious.